#1 - How do you like using three keyboard / mice at once? #2 - What is the 'elvis' style thing above your monitor? #3 - What is the map on the wall ? The map says "Telon" on it, which was the world of Vanguard back when that still existed. Too bad it failed, just didn't have the following it needed. 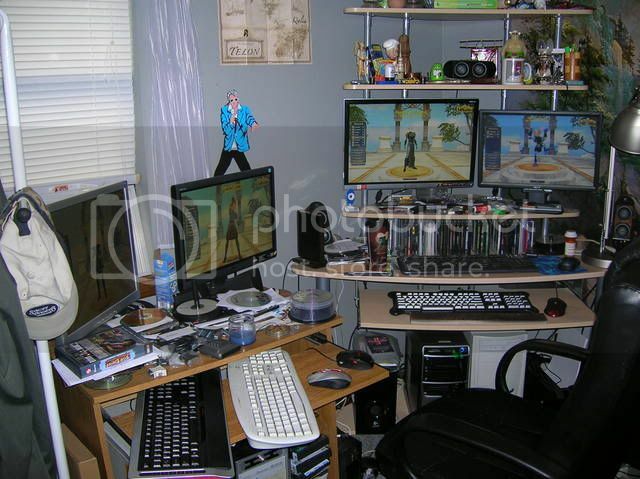 Heh, was actually 4 keyboard & mice (another on desk above keyboard shelf), & was a pita using 4. The Elvis was a clock, & his legs wobbled back & forth. And yes, the map was from Vanguard: Saga of Heroes.